Who here loves a good craft? 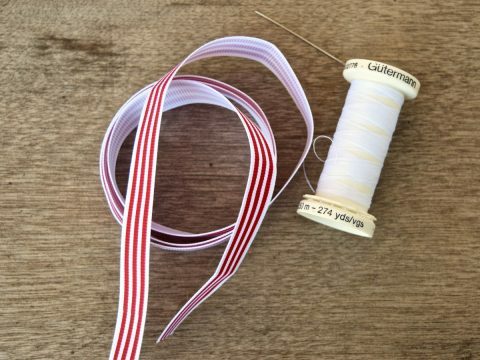 *raises own hand* Who here loves a good craft that celebrates your national holiday? *raises both hands* Who here loves a good craft that celebrates your national holiday and costs ZERO DOLLARS? 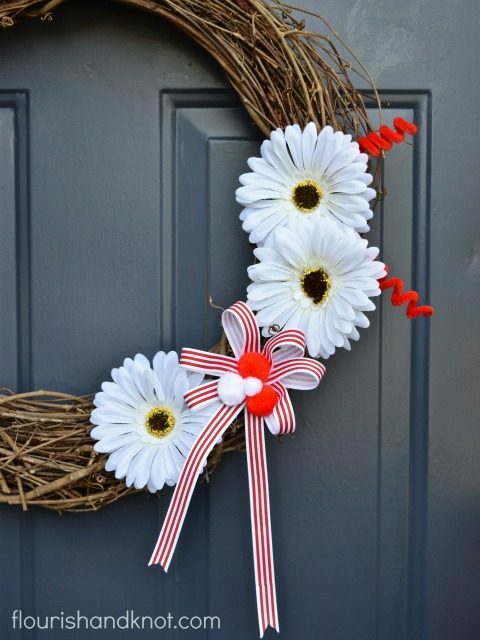 *raises both hands and feet* For the June edition of There for the Making – the Zero-Dollar DIY Challenge, I used items I already had in my craft stash to create a simple, cheerful Canada Day wreath in red and white for our front door. I remember making Canada Day crafts back when I was little (crafting has always been a part of my life), so I feel like I’m getting in touch with my roots with this project. In case you’ve missed the memo (or if you lives elsewhere than Canada! ), we’re celebrating our country’s 150th birthday on July 1st! Naturally, this is a cause for much hoopla and general celebration, and it means that the July 1st excitement is getting extended ALL YEAR! I thought it would be nice to display our Canadian pride with a fun, whimsical wreath. 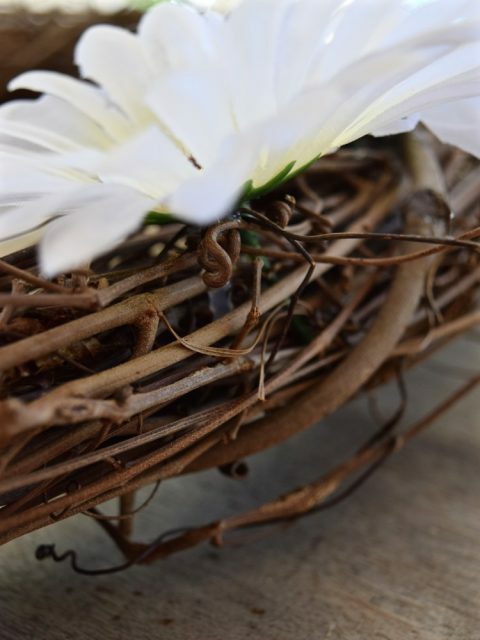 I’m joined this month for this no-spend DIY challenge by five other talented bloggers, who are sharing some summery DIY ideas with you. Make sure to scroll (and read!) down for the links to all their wallet-friendly projects! 3. Add pompoms (or another decorative element, such as a large button, small flower, or beads) to the centre of your rosette. I glued mine on but you could also sew them on. 4. 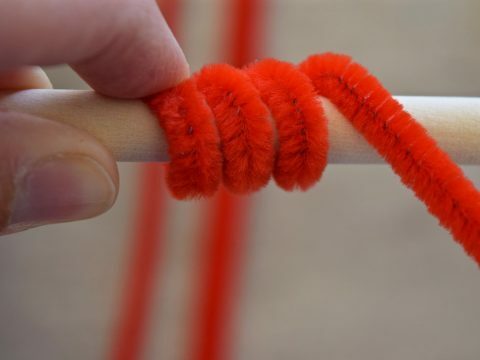 Create the pipe cleaner spirals by wrapping the pipe cleaners tightly around the dowel. You can spread out the spiral as much or as little as you wish. I varied the length of mine for some visual interest. 5. 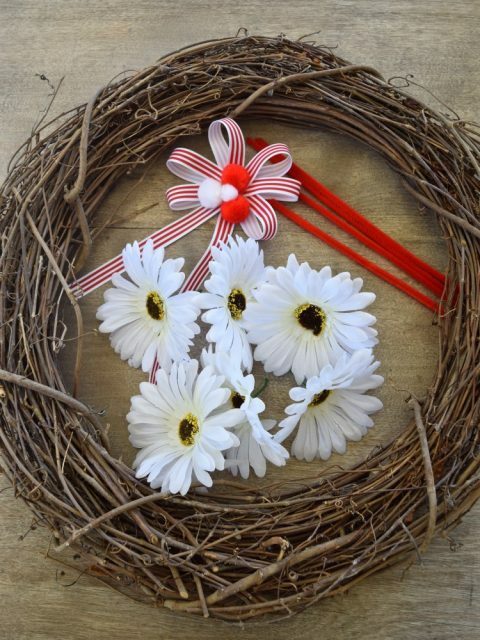 Glue the flowers to your wreath, making sure to be careful of your fingers with that hot glue! 6. Glue on the spirals, hiding the ends under the flowers. 7. 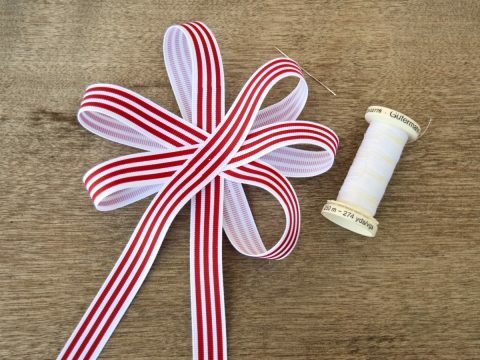 Glue on the ribbon and admire your handiwork! Are you making any special decor to celebrate #Canada150? Or maybe you hail from elsewhere in the world and have a national holiday coming up? Let me know what you’re making in the comments! I love to hear about your projects. Now that our door is all gussied up and ready for Canada’s big birthday, I’d love for you to check out yesterday’s Canada Day-themed BBQ! 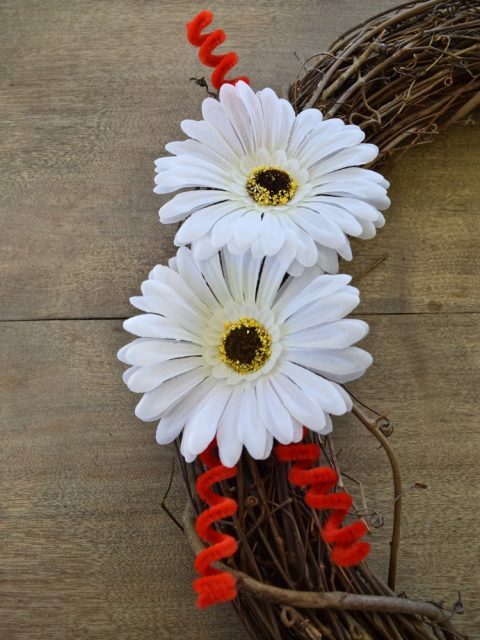 I have lots of red and white decor and some cool budget-friendly finds. Be sure to stop by and see all the great no-spend summer projects in this edition of #ThereForTheMaking! 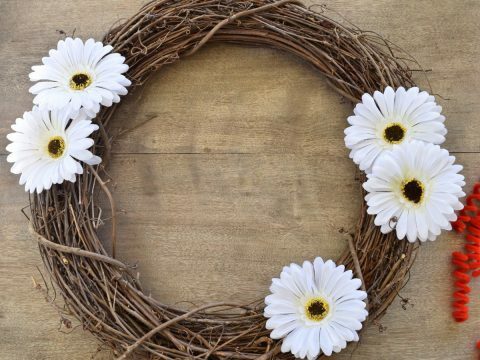 There is some great inspiration for your next craft and home decor DIY. Hi Sarah – your wreath is so pretty! How exciting to celebrate 150 years! Thanks for teaching us how to make the curly tendrils…definitely keeping that trick up our sleeves! Thanks again for leading the charge on this wonderful challenge. We have tons of projects we can put together! Thank you so much for being a part of it! I love to see what everyone comes up with from their stash. Such fun! 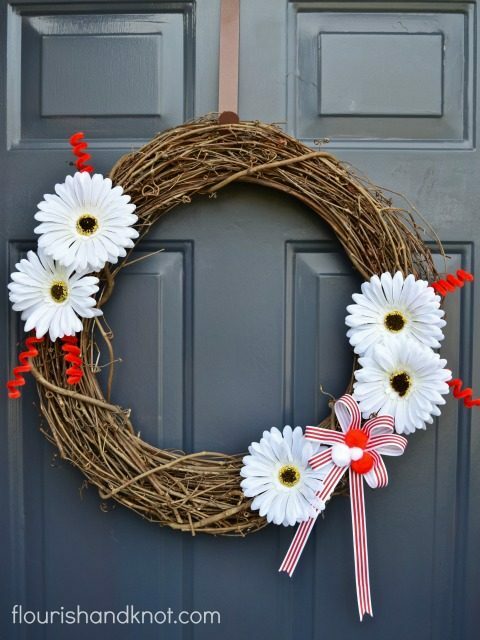 How cute is your wreath?!?! 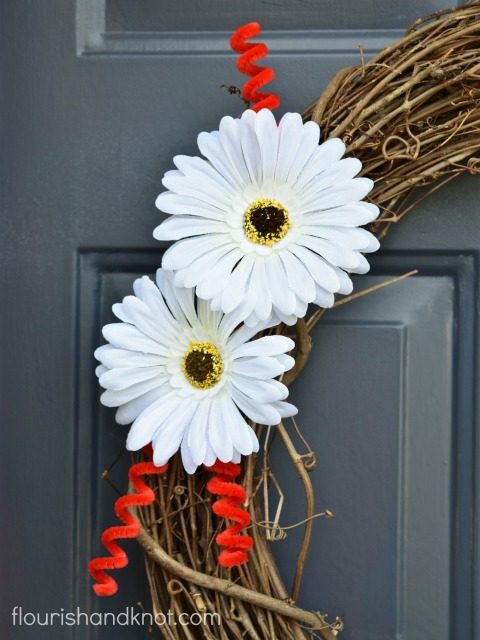 I’ll need to try this asap as I still have my Christmas wreath up – seriously. LOL!! This is so cute! Thanks for hosting such a fun challenge! Thank you, Meg! It’s my pleasure to host – I love seeing what everyone comes up with. How fun to be celebrating 150 years! 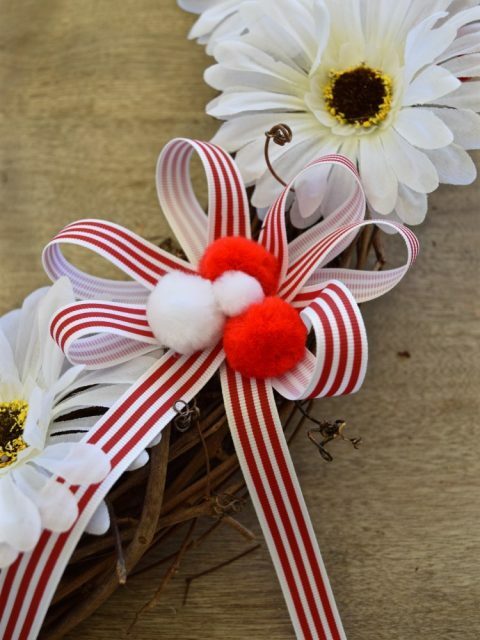 Your wreath is perfect for summer & Canada Day – I love the ribbon, pom poms & pipe cleaners you added! Thanks, Emily! It’ll be a fun weekend!